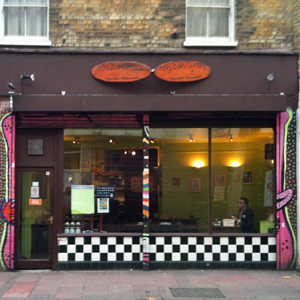 This small Japanese restaurant serves the best sushi in Brixton and rivals Kulu Kulu as our favourite Japanese restaurant in London . The decor of wooden benches and tables are simple but do not accommodate large groups. There is a rather odd green colour on the walls with, also odd, pictures of something japanesey which were a bit offputting. When it is heaving you really didn’t notice the decor but tonight as it was relatively empty it seems a bit on the bleak side. The sushi though are fantastic, with a wide variety of different types. We ventured into unknown territory this evening with the addition of vegetable tempura and gingery dipping sauce which made a change from the maki. The Phad Thai was one of the best I have eaten. Lots of different flavours with an edge of heat and lime and not too many noodles. It is definitely cheaper and much, much better than your average Yo Sushi. Most of the occasions we have visited have been in the evening when it has been heaving and we have to literally squeeze in, but tonight (Thursday) it was relatively quiet so perhaps Brixton Village is pulling away its custom. It also used to be open during the day but now only in the evening. Ichiban sushi has been a family favourite and now we have extended our menu choices I think for us it will still be able to hold its own against Brixton Village down the road. I just hope others don’t desert this gem of old Brixton.